Spyderco Szabo Folder in all Black is a striking design from the mind of one of the industry's top makers, Laci Szabo. Features a wicked upswept Scimitar-shaped blade composed from CPM-S30V powder steel that is partially hollow ground. 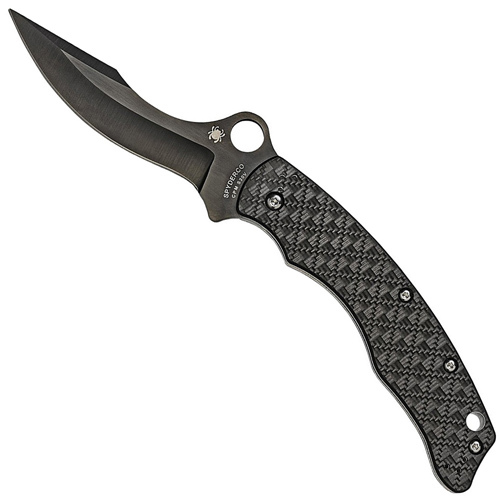 As this version is intended for tactical applications, the blade has been non-reflective TiCN coated and a round Spyder hole helps with easy opening of the extra large blade. 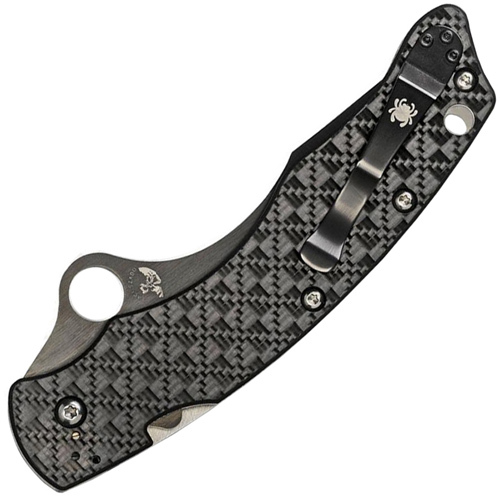 The handle is composed of Cubic Check carbon fiber and G10 laminate scales for a solid and comfortable grip as well as visual appeal. A cutout in the backside of the handle allows for easy access to the Compression Lock mechanism for quick closing of the blade. Includes a four-position carry pocket clip. Brand new direct from Spyderco.